GW Security 8 channel NVR system kit comes with built-in 8 port POE switch with inbound bandwidth up to 100Mbps, ready for any models of high resolution IP cameras up to 4k security camera such as GW Security gw8555 4k camera or the dome model of gw8571 4k security camera. The included 8pcs of GW5737MIC outdoor audio cameras provide you excellent quality that will blow you away. Have this surveillance system kit to keep your family safe as well as your pets and property safer, and you don’t need to spend a fortune and such kind of security monthly service. With built-in 8-port POE camera and 8pcs 5mp POE cameras what you need to do is to run CAT5e network cable from each of the camera to the NVR system. With easy to use app with appropriate nice GUI allows you access each of individual camera easily. Make sure that you update both NVR and the cameras with latest firmware. See also top 5 8 channel NVR system with POE cameras. The good thing with POE camera with network cable is that connection between NVR and each of the camera is more reliable than wifi connection which is prone to signal interference especially @2.4Ghz crowded band. The bad thing is that you need to run network cable from each of the connected camera. 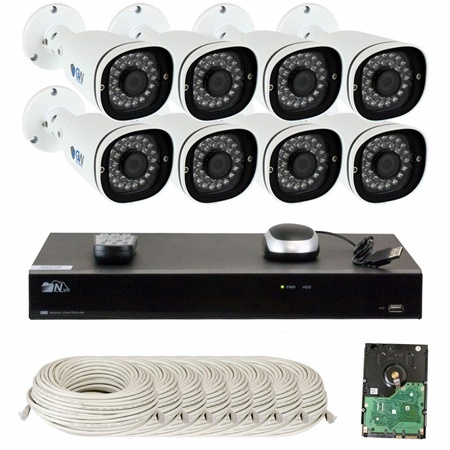 GW Security 8 channel NVR system kit comes with 8pcs of POE 5mp outdoor camera delivering as high as 2592×1920 pixels (5mp) resolution @15 fps, for faster frame rate @30 fps real time you can deliver 3mp or 2mp resolution. You might like higher resolution cameras such as gw8571 or GW security gw8555 4k security cameras. GW Security GW5737MIC 5mp camera supports day and night view, it supports night vision with 30pcs IR LEDS illuminating darkness night up to 100 ft distance (30m). It’s not like Lorex cameras that comes with CNV (color night vision) technology but it records in black and white view. See also Lorex lnz44p12 high speed dome PTZ camera which is designed with CNV technology to allow you view and record in color night vision as long as there is still ambient light. GW security 8 channel NVR system kit provides you a nice high definition camera security system for your family. A good technical support and one year warranty is a feeling safe assurance. GW Security 8 channel NVR system includes 8pcs of 5mp @15 fps outdoor cameras is tagged with reasonable price around $1,200.00 in Amazon. 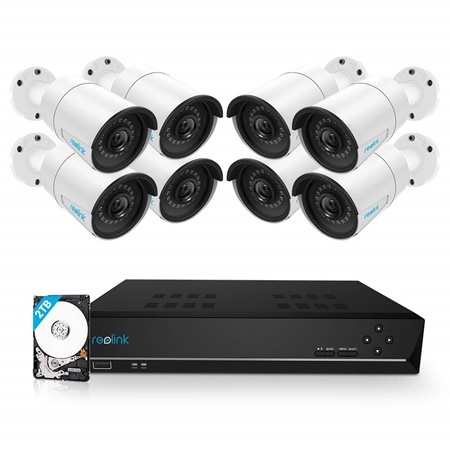 Now, should like to compare with other product with lower price you may consider the surveillance kit offered by Reolink 16 channel system plus 8pcs 5mp cameras. To help you make up your mind in selecting which one of the two surveillance kits offered by GW security vs Reolink the following two spec comparison tables show you spec comparison for NVR system and included 8pcs cameras. Reolink RLK16 system kit comes with built-in 16-port POE switch for up to 16 POE cameras and recording up to 5mp resolution @20 fps all 16 channels. See also Laview and Reolink 16 channel NVR system kits. For future expansion Reolink with 16-port POE switch is more favorable, twice as more channel than GW Security. However, Reolink is limited up to 5mp resolution instead of 4k offered by GW. As we know there are coming more 4k security cameras in the future. With GW you still need to purchase separate hard disk for NVR unit storing, Reolink comes with 3TB preinstalled HDD. All the included cameras are the same spec, 5mp resolution (frame rate is different) and night vision range is up to 100ft. Now, you judge which one is suitable to meet your business need. GW Security with 4k resolution delivers more detail image quality, however the included 8pcs cameras are 5mp @15 fps, even can only support up to 3mp @30 fps. Reolink offers more channel than GW, but limited up to 5mp resolution. Click the product links below to learn more details each of the product and buy from Amazon.